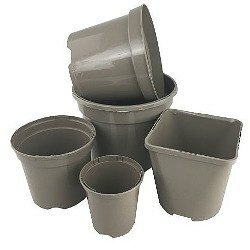 Taupe plastic plant pots are now available to buy online - The new recyclable grower pot. Gardeners across the UK have been eagerly awaiting the Taupe plastic plant pot to reach the market after being featured on BBC Gardener's World with Monty Don - but the wait is over, they're here! The new Taupe Plastic Plant Pots are made from carbon black-free, recycled polypropylene that can be identified by near infrared (NIR) and consequently recycled through kerbside recycling schemes, allowing you to easily dispose of garden pots in a way that has not been possible before. Taupe pots (a greyish brown mushroom colour) are set to revolutionise potting. They look great and protect your plants roots from light, but also have the advantage over regular pots in that they can be easily recycled - what's not to love! Here at The Garden Superstore we lead the way on innovative and professional gardening supplies, so are pleased to be the first retailer to offer gardeners the long-awaited recyclable plastic taupe pot. Taupe pots are now available to buy online in a range of sizes. They're not all up on our site yet, so if you don't see the size you require then please contact us. I would very much like some information regarding these pots, i was looking at the vipots, but if these are going to be closer in price to the standard blacks ones then yes please. Hi Christina, the taupe pots are now available on our website with plenty more information. Hi Angela, taupe pots are now available to buy online on our site. Hi I would like to trial these for a masters dissertation, please can you let me know of availability. Hi Sophie, that sounds like an interesting study, taupe pots are now available to buy on our website.